Parenting is not easy and especially with small kids and infants, it’s more difficult as they are too small to take care of themselves. They even can’t explain their problem or pain with us. As a parent, we need to understand their pain and we should try to avoid all such things which are not good for them and their health. We should be extra careful while choosing baby care products. It should be from a reputed brand and should be of good quality. As if we choose not so good products it can cause allergy or rashes which is too bad as the kid feels too irritated and will cry. A few decades back when diapers were not there and not so common, mothers used to have only cloth diapers for their kids. Using it was not easy but at least it was changed frequently so fewer chances of having diaper rashes. But now with the change in lifestyle mom’s prefer using diapers which is quite convenient and easy to use. But regular usage of these diapers can cause diaper rash which is very painful and the child gets irritated and annoyed and if not treated properly can cause health problems. * Use diapers from good brands, one which can absorb well and keep baby’s skin dry. * Change diapers frequently, after 4-6 hours, in any case, should not be used for more than 6 hours. * Every time baby poops, change the diaper immediately. 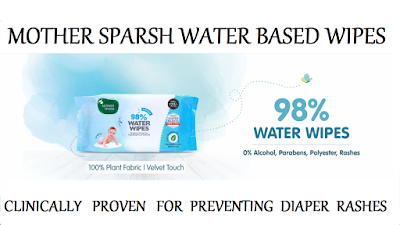 * Use wet wipes from a good brand like Mother Sparsh while changing diapers. Studies have shown that even properly washed clothes can have germs and using such clothes for cleaning can cause severe diaper rashes. Sometimes when clothes are not washed properly it has residue of detergent and dirt in it which is not good for baby’s skin, can cause allergies and rashes. So better to use good quality wipes while changing diapers. This would help to avoid diaper rashes and will keep baby happy and healthy. Today the market is flooded with wipes from various brands. But all are not good ones, some are synthetic ones and we should avoid such brands. To check the quality of wipes we can do a simple Flame Test at home. In my previous article, I have shown How I did Flame Test for Mother Sparsh Wipes. And was happy to find that these wet wipes are of good quality and are not synthetic. When burnt they did not leave a hard residue but burnt like paper which shows that they are not synthetic. * They are made from plant-based fabric and are biodegradable. * They are dermatologically tested and are hypoallergenic. * They are PH balanced. * Free of parabens and other harmful chemicals. * Enriched with vitamin E, Aloe Vera & Jojoba Oil. * It is 98% water wipes, so as good as water and cotton. * They are thick and do not tear while usage. * Product Packaging is good. * Affordable price, Rs 170 for 80 wipes. 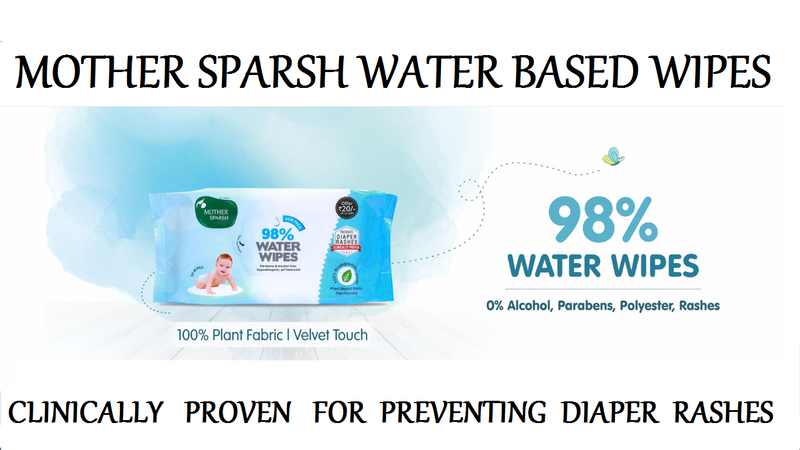 One can check more about these wipes on their website mothersparsh.com. One can buy these wipes from Amazon . Do tell me your views if you have used this wipes. Welcome, happy that you found it useful.